At Entheos Academy, we are crew – not passengers. Our crew is our family! When you join the Entheos crew, you become part of that family, and we will do everything in our power to uphold our values and make you feel at home. If you are interested in becoming a role model for students of all ages and joining our crew, please check this page often for new job listings. We’re happy to have you on board! Click on a position’s title to view its details. Please keep checking back for new listings. Entheos Academy a K-9 Expeditionary Learning charter school is hiring for the position of Computer Lab Paraprofessional at its Kearns campus. Work under general supervision to assist students and teachers in use of computers and educational software in campus computer lab. Assist teachers and students in use of computers, printers, and instructional software. Work cooperatively with teachers to identify student placement in instructional software. Maintain computer lab in a neat and orderly manner. Manage student behavior in the computer lab. Help supervise students during arrival and dismissal from school and as assigned. Must have completed at least two years of study at an institution of higher education; or obtained an associate’s degree or higher degree; OR meet a rigorous standard of quality demonstrated through a state sanctioned Praxis assessment. Strong reading, writing, and speaking skills in English. Ability to push/pull heavy computer carts. Ability to kneel, stand, sit, for prolonged periods of time. Ability to move quickly/run in case of student emergencies. Ability to build positive relationships with students and staff. Ability to follow directions and learn new tasks quickly. Have a love for kids and a very positive attitude. Entheos Academy, a kindergarten – 8th grade Service Learning charter school is filling for an Elementary School Para Professional. Position available at the Magna Campus. Works under the direct supervision of the teacher to assist individual students with classroom activities. Provide assistance with individualized program materials. Assist the teacher in observing, recording, and charting behavior. Assist the teacher with crisis problems and behavior management. Carry out instructional programs designed by the teacher. Provide special help to students in core subjects. Supervise students during recess, lunch and special classes. Accompany and assist with supervision of students on fieldwork. Meet a rigorous standard of quality demonstrated through a state sanctioned Praxis assessment that assesses your knowledge and ability in instructional assistance in reading/language arts, writing, and mathematics or reading readiness, writing readiness, and mathematics readiness. Ability to navigate different kinds of terrain on fieldwork such as steps, mountain paths, and uneven ground. Ability to walk at least a mile while on fieldwork with students. Ability to endure climate conditions such as heat, cold, wind, rain, snow experienced at recess or on fieldwork. Manage a case-load of approximately 25 6th through 8th grade students. Coordinate the services of the case-load with the assistance of para-professionals. Work in conjunction with the Special Education Team to conduct IEP meetings, administer assessments/testing, and ensure file compliance. Assume responsibility for fully implementing the EL design while covering state core standards. Understand and become fully committed to the Entheos Charter, Mission, and Values. Intentionally build a school culture that evidences high expectations for service, excellence, and leadership. Model a commitment to on-going professional development by participating fully in off-site conferences, institutes, summits, regional programming, and Expeditionary Learning trainings. Motivate, effectively manage, and inspire students. Align the use of time, talents, and material to the school’s mission. A valid Utah Professional Educator License with a Special Education Mild/Moderate or Severe Disabilities Endorsement. Willingness to learn new curriculum and ideas. Teachers need to be prepared to attend training workshops and conferences throughout the year. Individual who is innovative and resourceful. A commitment to high expectations for self, students and staff members. A commitment to frequent communication with families and community. A ready willingness to examine and alter less successful practices. The pursuit of quality, excellence, and craftsmanship. Ready and able to work creatively and collaboratively with faculty to plan curriculum and problem solve. Performing other duties as assigned by the administrator. Associates degree/2 years of study at an institution of higher education or more. Have a love for kids and a very positive, flexible attitude! 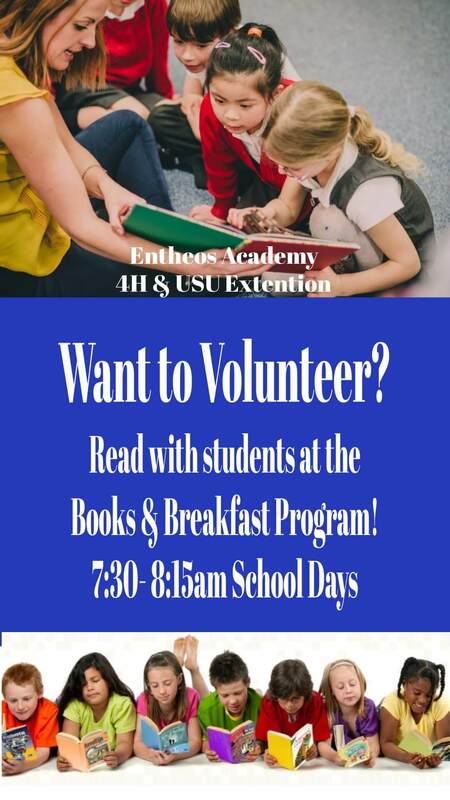 Every school day at the Kearns Campus, students can spend their morning eating breakfast and reading books with a volunteer through our Books & Breakfast program!